A drop in the ocean, a needle in a haystack, a single grain of sand on a beach...or a single molecule in a cell. Until recently, studying individual molecules in cells seemed nearly an impossible challenge. That is, until now. A Pacific Northwest National Laboratory (PNNL) -led research team working at the Environmental and Molecular Sciences Laboratory (EMSL) has produced the first correlative chemical imaging results, using their novel approach, "super-resolution fluorescence guided imaging mass spectrometry." This new technique allows scientists to study the cell membrane in unprecedented detail while also peering through it to examine cell dynamics at the molecular level. Led by PNNL‘s Dr. Xiao-Ying Yu, the team studied mouse lung epithelial cells exposed to toxic nanoparticles, particularly zinc oxide (ZnO). They demonstrated that ion transport in the cell membrane can be observed using their approach. By combining their microfluidic method with liquid secondary-ion mass spectrometry, researchers were able to view the chemical's effect on the cell membrane after it processed the toxic ZnO nanoparticles. The research is a direct response to mesoscale science challenges put forth by the U.S. Department of Energy's (DOE's) Office of Basic Energy Sciences (BES). BES funded the initial design, followed by funding of further development and testing by PNNL's Chemical Imaging Initiative. The research also addresses challenges set forth by DOE's Office of Biological and Environmental Research (BER), and is now funded by PNNL's Earth and Biological Sciences Directorate. Why It Matters: The researchers' innovation presents far-reaching potential for diverse applications. It enables surface analysis of cell membranes in a liquid and provides the first direct observations of ion transport in single cells. It also advances understanding of the molecular dynamics of the cell membrane in response to stressors. "Of course, the most direct application of such technology is to study single-cell nanoparticle toxicity based on our results," said Yu. "But we can also study cancer-drug interactions and microbial community interactions as well as other applications in systems biology." Yu noted that they studied mouse lung epithelial cells merely as a canvas. Their new microscopy method is not limited to mammalian cell studies, but also applies to microbial communities. For example, researchers can use it to study pathogenic microorganisms that cause infection and disease. "Being able to clearly observe the cell membrane and molecules within cells holds vast potential for addressing many science questions," said Yu. "The challenges set forth by the Office of Science specifically inspired us to pioneer methods to follow single molecules and dynamics at the molecular level," said Yu. "Such capabilities are important to truly understand cell-to-cell differences and help us understand how cells work at a fundamental level." Methods: The research team used a PNNL-developed, vacuum-compatible microfluidic interface called System for Analysis at the Liquid Vacuum Interface (SALVI) to culture mouse lung epithelial cells. They exposed the cells to environmental stressors like zinc oxide nanoparticles and then studied cellular changes. The researchers observed these changes using advanced imaging techniques at EMSL, a DOE national scientific user facility located at PNNL. "Specifically, we used super-resolution fluorescence to guide imaging mass spectrometry to obtain submicron chemical imaging," said Yu. The researchers' main goal from the outset was to obtain better understanding of single cells by coupling existing approaches. They describe it as more than a "technique-development effort" intended for broad applications across the sciences. What's Next? Yu and her research team are excited to continue work at EMSL to study novel magnetic nanoparticles as cancer drug carriers, following how they attack cancer cells. The researchers also plan to look into co-cultured biofilm communications. They hope to capture the chemical speciation change at the biointerface between two types of microbial communities and decipher how they "talk" to each other, whether using protons or electrons. Sponsors: This research was supported by BES, PNNL Laboratory Directed Research and Development (LDRD) through the Chemical Imaging Initiative, and the Earth and Biological Sciences Directorate (EBSD) mission seed LDRD fund. EMSL supported the research with its advanced microscopy facilities. Reference: Hua X, C Szymanski, Z Wang, Y Zhou, X Ma, J Yu, J Evans, G Orr, S Liu, Z Zhu, X-Y Yu. 2016. "Chemical Imaging of Molecular Changes in a Hydrated Single Cell by Dynamic Secondary Ion Mass Spectrometry and Super-resolution Microscopy." 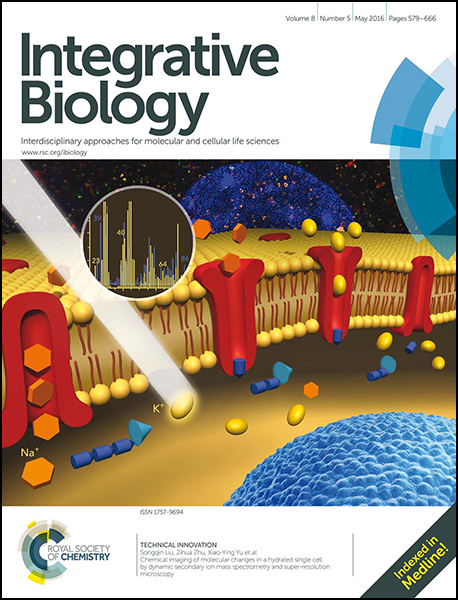 Integrative Biology 8:635-644. DOI: 10.1039/C5IB00308C. In one sentence: A PNNL-led research team has produced the first correlative chemical imaging results, using their novel approach, super-resolution fluorescence guided imaging mass spectrometry. In 121 characters: New technique lets scientists study a cell membrane in unmatched detail and examine cell dynamics at the molecular level.